For more information about registration and a look at past year's entries, visit the Design Village website at designvillage.wix.com/designvillage. Questions? Email designvillage@calpoly.edu, designvillage.calpoly@gmail.com, or the Faculty Advisor Dale Clifford at dtcliffo@calpoly.edu. 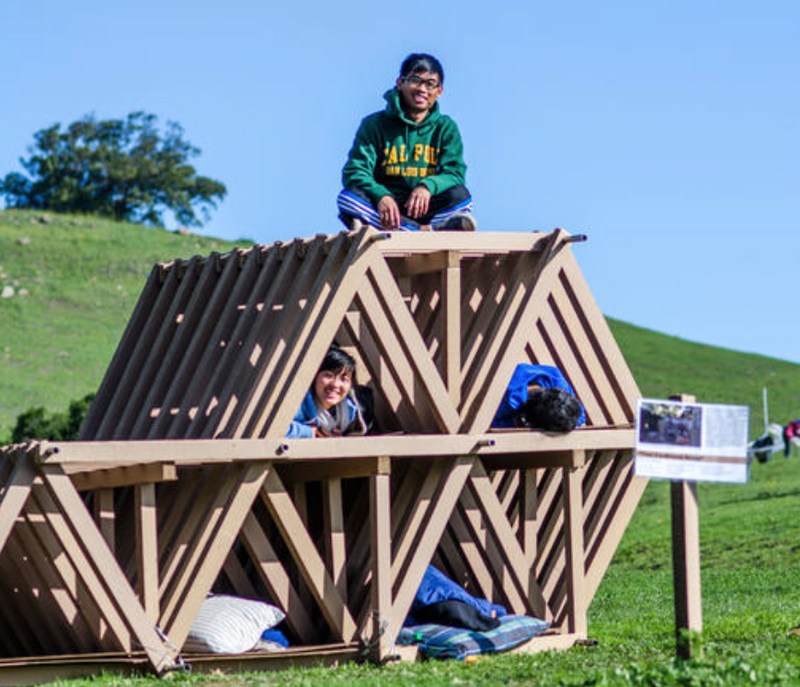 As currently the only truly-native competition hosted by Cal Poly's prestigious undergraduate Architecture program, the Design Village competition has a long history and has become one of the most anticipated events of the year for the College of Architecture & Environmental Design (CAED). 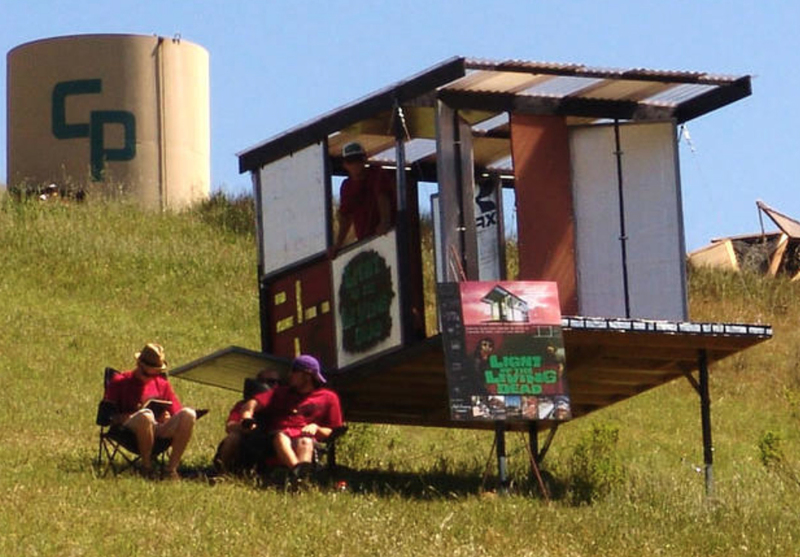 True to our "hand's on" experience, competitors design and build "shelters" in which said competitors inhabit their respective structures throughout the entirety of the weekend. 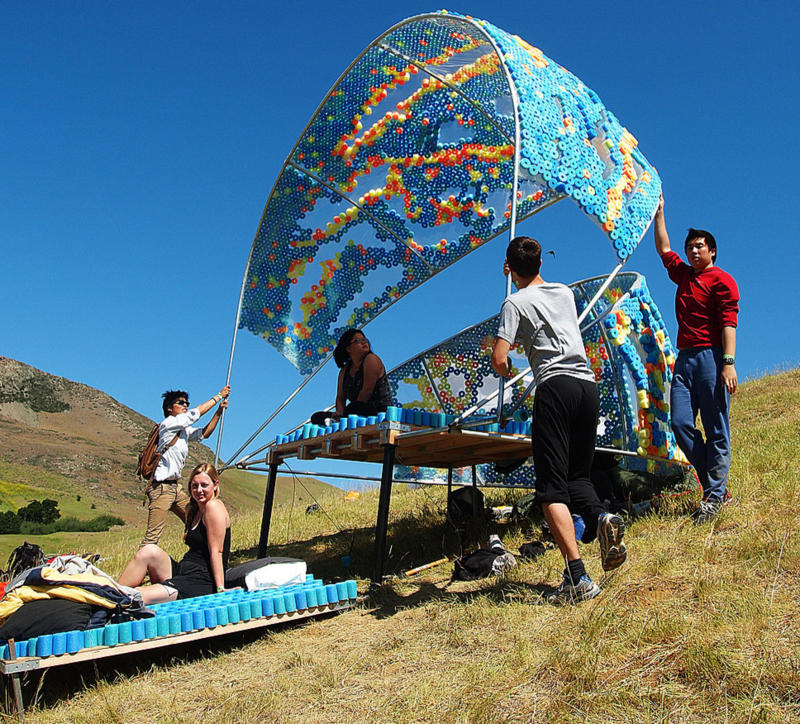 Click HERE to view Design Village videos on the Cal Poly Architecture Department's YouTube Channel! This year our theme is Balance. Balance is to offset or compare the value of one element with another. In their design, participants will select two contrasting concepts and decide how they interact. Consider how the concepts act alone and then define the moments where they meet and under what conditions they intersect. In 2017 the theme Essence focused on developing one central idea which is manifested in the project from part to whole. Competitors were challenged to experiment wih a core idea and focus on an essential quality of their design - light, material, space, or other theme of their choice. 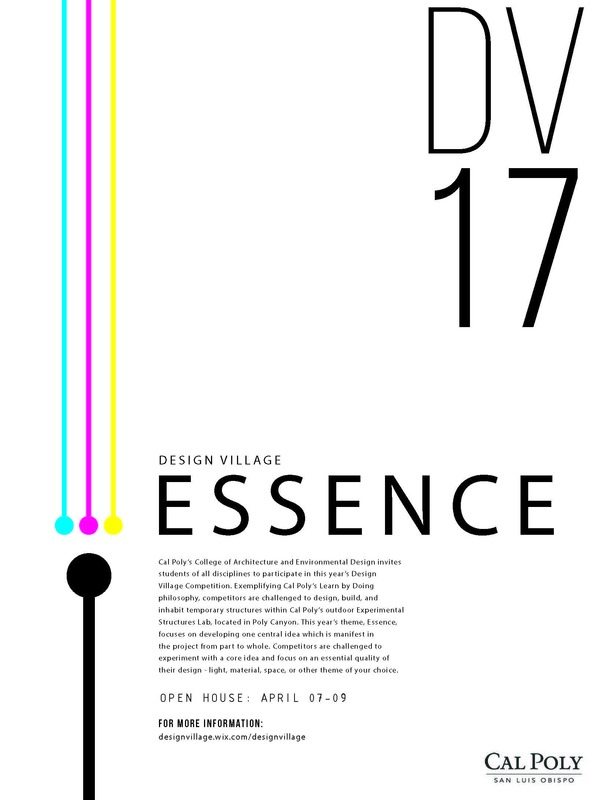 For images from the event, visit designvillage.wixsite.com/designvillage/2017-essence. Check out this great video by ARCH first year student Ali Harwood of their group's 2017 Design Village entry from concept to completion! 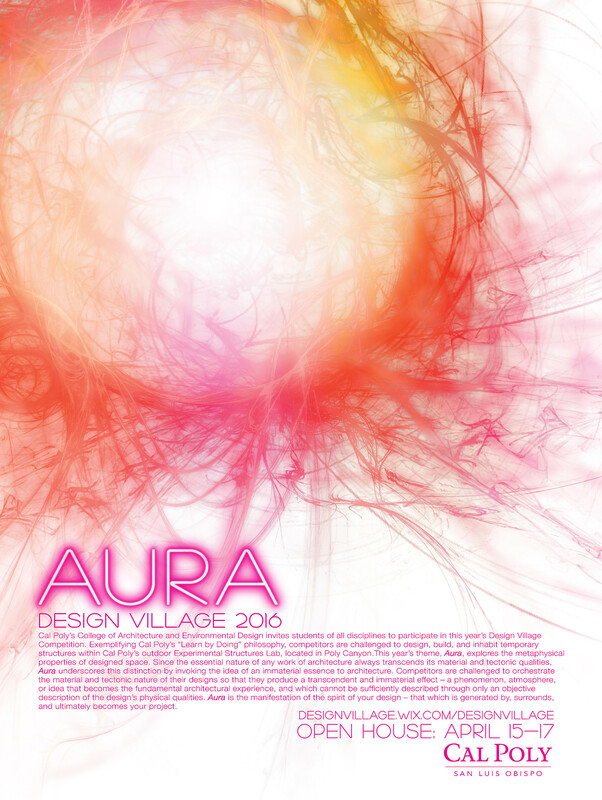 In 2016 the theme Aura explored the metaphysical properties of designed space. Since the essential nature of any work of architecture always transcends its material and tectonic qualities, Aura underscores this distinction by invoking the idea of an immaterial essence to architecture. Competitors were challenged to orchestrate the material and tectonic nature of their designs so that they produce a transcendent and immaterial effect – a phenomenon, atmosphere, or idea that becomes the fundamental architectural experience, and which cannot be sufficiently described through only an objective description of the design’s physical qualities. Aura is the manifestation of the spirit of their designs – that which is generated by, surrounds, and ultimately becomes the project. Here are some videos highlighting the 2016 event! In 2015 the theme Clockwork highlighted the dramatic complexity of a complicated but precise system that relies on various integrated components. 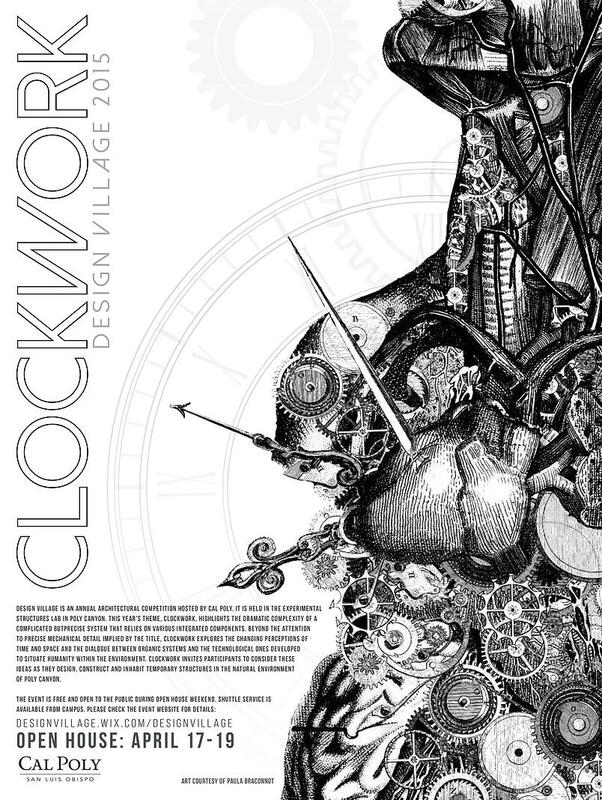 Beyond the attention to precise mechanical detail implied by the title, Clockwork explored the changing perceptions of time and space and the dialogue between organic systems and the technological ones developed to situate humanity within the environment. 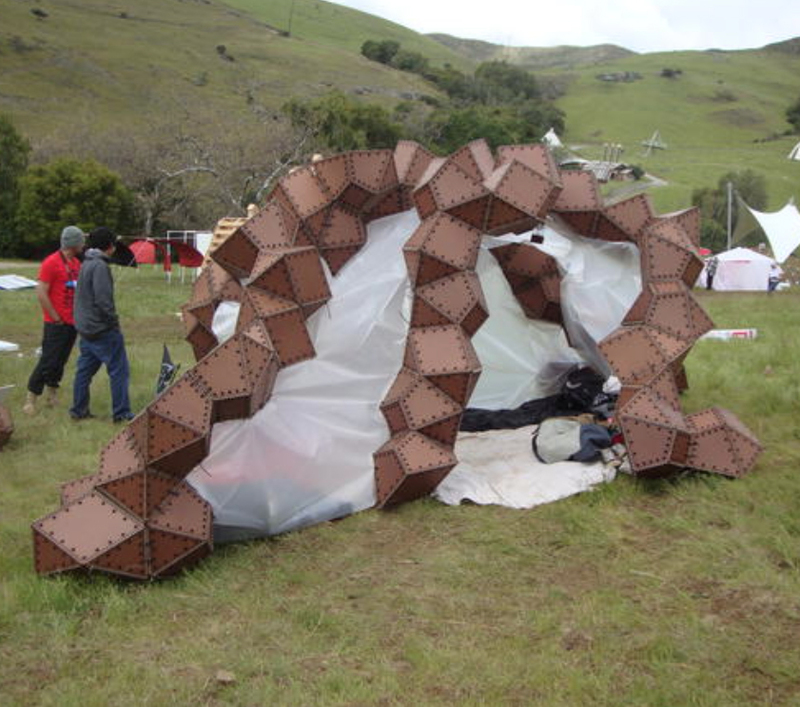 Clockwork invited participants to consider these ideas as they design, construct and inhabit temporary structures in the natural environment of Poly Canyon. In 2014 the Design Village theme was Biologics, which came from the increased focus on the natural environment as a source of new ideas and applications. Elements of nature surpass human constructs in both their range of application and their diversity, offering examples that are different from and sometimes preferable to those derived from human logic. We therefore challenged competitors to think creatively about the intersection of natural and human logic in order to discover new and innovative applications within the realm of architecture. In 2013 the Design Village theme was Make. Move. Play. This theme derived from the desire to return to a state of mind fueled by imagination and wonder. So easily do designers forget why they do what they do or temporarily lose sight of this quality of life that the profession often inspires. We challenged competitors to consciously be aware fo the process of making, moving, and playing once more and be inspired by everything. With this in mind, perhaps we might build a village community that is not only practical but also whimsical and lovely. In 2012 the Design Village theme was Metamorphosis, which was based on the increasing need for adaptable architecture and flexibility in design. Each entry was required to morph into three different phases. In phase one, “shelter,” the structure had to house the team. In phase two, “engage,” it had to interact with other Design Village neighbors. In phase three, “afterlife,” it had to benefit the team’s hometown community. Social parametrics defined the 2011 Design Village by requiring that each structure incorporate at least two physical connections to other structures on the competition grounds. To reinforce the idea of network building, each team had to consider the quality of the interstitial spaces that emerged within this temporary community. In the construction of structures informed by the concept of social parametrics, teams took cues from the canyon site and from the unknown environment presented by other teams and their structures. The exquisite corpse formed by the network of linked structures became a physical manifestation of the socially networked present and its ability to create something greater than the sum of its parts. During the Great Depression, Central Park became a city of lean-tos and shacks, occupied by the populous that had been ejected from their homes due to their inability to pay rent. Shelters were thrown together with whatever they could find, re-used materials and some pirated (stolen) products. 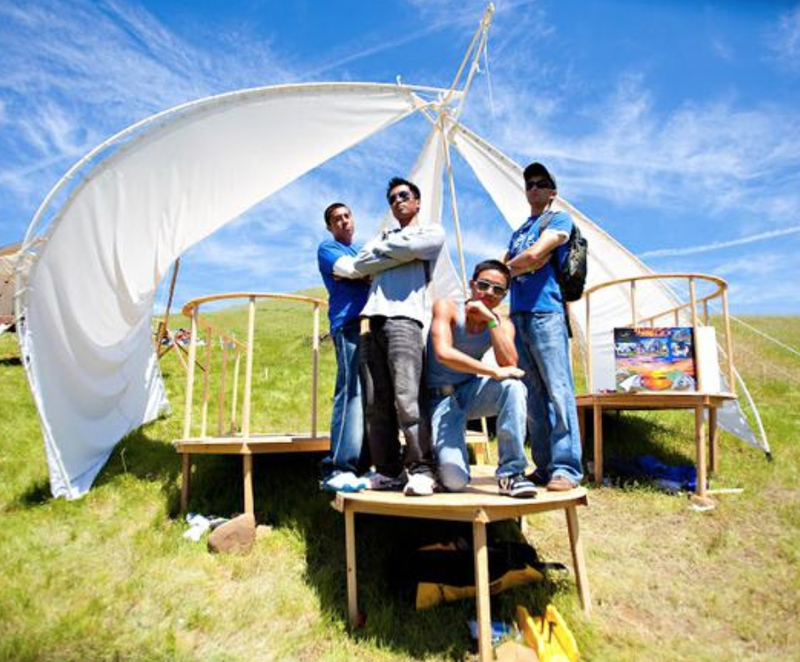 While they discouraged the theft of anything used in your structures, in 2010 Design Village based a large portion of the judging on the criteria of re-used materials, requiring no more than 20% of the materials used actually having been purchases, which means the teams had to scavenge for those materials that made up the other 80%.